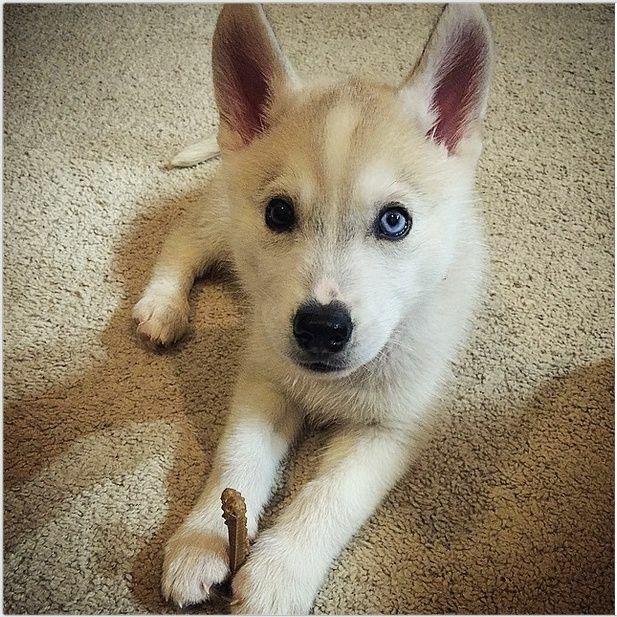 I have been reading and looking over the forums for over 3 weeks now, just trying to obtain as much information as possible for my little pup. He will be 11 weeks come Thursday and his name is Harvey! And here is the obligatory picture. He is super smart for how young he is, we have finally grasped the idea of potty training, as he hasn't had an accident inside in almost a week now. He will go and sit by the patio door when he needs to go out and he will sit on the outside when he has finished his business to come back inside. He gets his second round of shots tomorrow, and he gets a lot of time to play around the condo, sleeps throughout the night very well, I still wake up every 4-5 hours to let him out to do his business. There are a couple of issues I am having though, and I don't know how to stop the behavior as I have tried almost everything. So Harvey will chew on his toys for approximately 7 seconds, and then try to bite my legs and feet. I tell him no or ah-ah and hand him a toy thats okay for him to chew on, but he is just super stubborn and only interested in chewing on my legs. I am thinking about buying more toys and seeing if he takes to anything in particular, but he currently has an elk antler that he enjoys most of all. If anyone has any suggestions on how to get him to stop wanting to chew on my legs and feet I would greatly take the advice. Furthermore, I have introduced him to my moms cats and they play together very well, and it tires him out a lot. I haven't taken him around any big dog locations as he does not have all of his shots yet. My big question is, how can I take him on walks and drain his energy in a way thats safe for him? I can only play "fetch" with him so much in the condo, and let him chase the ball which he wont bring back, so its just me throwing it to myself while he runs back and forth. I want to expose him to as much as possible, my friends come over to see him, but I would like to be able to take him out on walks without him getting sick. Sorry for rambling so much, but it has just gotten a bit stressful with the nipping and the lack of ability to drain his energy efficiently inside. I would be more than willing to answer any other questions you might have, but I just really need some advice! Thanks a lot and I really love the site! What types of boundaries have you set for Harvey already? Crate? Threshold? Furniture? Toys always/not always available? Do you instigate play with him that gets him excited and causes him to mouth you? So as far as boundaries go, he has a huge crate that is partitioned off to give him enough room to sit, stand, turn around and lay in. I never leave him in there for more than 3-4 hours if I am not home (I always make sure to come back so he can be let out). If I am home, which I am almost all day everyday, it is in increments of 30 minutes to an hour only a couple of times during the day. He is not allowed on any of the furniture, and when he tries to get up on there with his two front legs, I have been trying to teach him "down", this is only working 50% of the time. His toys are always available to him, I will put some in the crate with him, and he will go and take them out and play with them. And no, I don't instigate any rough housing that would cause him to get excited and mouth me, and very rarely do we play any tug-of-war type games. I am literally just standing and he goes for my legs and feet after dropping his toys. Awesome, it sounds like he is getting a good boundary foundation for distinguishing dog life from human life. This is one of the keys to teaching them not to mouth you on their terms. If you're well read on here then you know that Huskies are extremely mouthy, both physically and vocally. It is a perfectly normal and natural way for them to interact with their pack. You'll have to experiment with correction techniques that work for your puppy, but just keep in mind, his goal in being mouthy is social. It's not biting and it's not aggression. It's social. So with that as his drive in the behavior, leverage that in correcting him. Stop whatever you are doing, and calmly walk away without touching him or petting him or speaking to him. The classic correction techniques often advised are yelping, reverse pressure in the mouth, or yelling No. These may or may not work with your puppy. Huskies are resilient and stubborn and very tough and they will likely just ignore these or turn it into a game. If one works for you, great. But do it and then proceed to walk away and isolate your puppy. Addressing the behavior immediately is one thing, but addressing what is driving the behavior is another. If a combination works for you, then great. Often though, a direct negative correction won't do much. Another strategy is to actually invite him to mouth you. Wear very baggy sweat pants and sweat shirts and get down and play. Explicitly invite him and let him go to town. When you are done, say "off" or "release" or whatever similar command you want to use and then walk away cold turkey. This will teach him that you are in control, fun things come from you, and you set boundaries with him. His impulses do not just get him what he wants. Far and away, with a Husky, mouthing and impulse control are monumentally difficult life lessons to teach. Your job is to remain consistent and calm while doing it. They use their mouths when excited, always. Teaching him about pressure (bite inhibition) and appropriate time will be a huge foundation for your leadership with him. It will be maddening at times, no doubt. Just try not to escalate your energy because he will mirror you and then you are being counterproductive, together. Lol, Jeff beat me to it.....Similar approaches, and yes I still get down on all fours and mock husky play, outside we stalk each other and just have a grand time. Wow thank you so much for that, I will definitely try the isolation tactic, hopefully that has some effect since "no" or yelping really aren't doing much. The sweatpants idea sounds great as well, as he is more prone to biting when I have long pants on compared to when I am wearing shorts, so I'll try that. Oh yeah, one tip about toys. If his toys are always available, then this can have two negative consequences. One, he will get bored with them quickly. Puppies are fickle. Put something away for a day and then it's the best thing ever, again. Two, they fail to see the difference between his stuff and human stuff. So the shoes, the rug, the remote controller, the sofa legs, etc. all are fair game for chewing. This is one thing that can make teaching impulse control difficult because it is a lack of boundary in the home. This can promote him mouthing on his terms. Just remember, if you allow this, you have to invite him and initiate it and make it very obvious and clear when the game is over. If he isn't learning the difference between invitation and impulse, then you lose. Yeah I am also thinking he is not receiving enough mental and physical exercise either, which isn't helping the situation. I have not begun much leash training, but as far as general training goes, I am using the NILIF technique, which has helped tremendously in getting him to sit. So far he will sit 80% of the time when I tell him, if he isn't distracted. And he will sit and wait before I put his food down. "Come" works fairly well too, getting him "down" from furniture is a bit more difficult. My biggest concern with the leash training is that I am afraid to take him outside and have him get sick. I can only do so much inside. I will definitely remember that. And I will start hiding some toys and not letting him have full access to them at all times. Inside the home is PERFECT for leash training! Use hallways and narrow walkways to teach healing and following. Do lots of switchbacks in the narrow areas and he will physically be forced to heel and stay behind you. This is how competition obedience people teach heeling, by walking along walls with the dog on the wall. You have a sled dog mouthing on you afterall (ha!) and leash manners is another huge life lesson. He is a little learning sponge right now and you are behind on leash training already. Take advantage of this time now, you'll be glad you did when you get him outside. Ha, you aren't kidding about being behind. The few times I've put a leash on him, he just sits down and tries to bite the leash...and that's all that we get. I take it away from him, he walks for a couple of steps...boom, sits and starts biting it again. I agree with Jeff you need to start and stop, never him, removal of toys yup that's a biggie, rotate them so boredom doesn't set in. You can start some initial leash training in the house, just so he gets used to the leash and simple leash techniques. Also he may be teething, so that will up his biting issue. Jeff you must type way faster than me, lol.......yes leash training inside is important, especially now, like Jeff said he's a tad bit behind.....All this will tire him, and make for a more manageable husky pup. Biting his leash is a perfect way to teach recall....."let's go"
I do type fast, ha, and I'm also firing on all cylinders right now mentally with my dog training...uh....training so this stuff is all sharp and fresh for me. Haha, this is true. I told my partner tonight that if we had a German Shepherd with my training he'd be the most perfect, obedient, off-leash dog ever. Instead, we have Mr. Stubborn Impulse pants. I actually think it is a great idea. Who better to train (or help people train) dogs than someone who is successful at training a husky??????? I don't believe I would consider myself quite as adept to training as you, however, it would be quite lucrative and rewarding personally, in my area(no trainers within say 200 miles), it crossed my mind once, lol. I don't think I could deal with little yappy dogs, or people who won't listen to suggestions and techniques, amongst my poor advanced leash training(and probably some other little bits and pieces ). I'm blah blahing, and hijacking, sorry OP.......I think you'd be a great trainer......Will you be training all dogs or husky only? Haha! No worries at all, I am enjoying the conversation. I will take and implement all the advice you both have suggested and see what sticks. And another thing I was planning on doing is taking Harvey to an all puppy play training class on Saturday at this pet resort and training center that is supposedly really good. Hopefully that can expose him to some new things. All dogs, family dogs. My platform will be non-food based training built on calmness, relationship, and drive. Op, I think that is a great idea, however, I'm a rural setting, so nothing like that here. Jeff would have much better insight as far as safety concerns at his young age as far as things like parvo is concerned. Excellent plan. Now you have 5 days to leash train him. Do it! Link's name was Too Bad in puppy class because he was so mouthy and wrestled a lot. This will normally occur closer to the year old mark, or even after. Huskies seem to bond slowly and there's a lot of reading between the lines with them. Thank you for sharing this post, I'm going through all of the exact same issues with Klaus right now. He's 13 weeks, it's nice to see he's going through the same thing as your pup and we're not just a failure as parents lol. He doesn't really go for our ankles but our wrists, hands, and the worst our face (specifically the nose). Playfully of course, I've never seen him show any sign of aggression but it's still definitely stressful. I have little cuts on my hands at any given time. We tried the bitter apple spray, he just completely licked it off my hands, maybe this will work for you though? I heard it works great for some people. Nothing but a time out seems to work with him, I wish I would have started it sooner with him. Yelping or "NO" just gets him going even more, he looks us straight in the eye and barks and runs constantly testing us. Ours won't fetch either! I wish he would, it would be a great way to tire him out since he can't really go to parks or anything yet. And YES he passes up on all of his toys after a few seconds and just wants to chew on us and the cat instead. Most of his toys are on the ground at all times, I guess he is bored of them. As far as the leash training goes I agree with the indoor leash sessions. Klaus pulls like a mad dog, to the point where he coughs, but we've been working indoors and it seems to be helping. Subject: Re: New puppy questions!